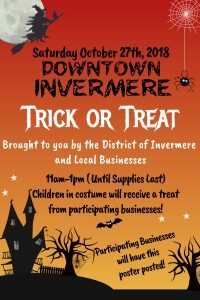 The District of Invermere and Local Businesses are pleased to host Trick or Treating in Downtown Invermere on Saturday, October 27th, 2018. This event welcomes families to downtown Invermere for a community event supported by local businesses. The event runs from 11 am to 1 pm on the Saturday before Halloween. This is a free event that will run rain or shine. Participating businesses will have a participating poster on their doors inviting treat-or-treaters! As businesses get involved, they will also be listed here! Children should be accompanied by an adult into stores and on the street while they trick-or-treat. Children should be dressed up in costume and should be dressed for the weather. The downtown streets will remain open to vehicular traffic for this event. Please use crosswalks to cross the street. Parents are to supervise children when crossing the street. Please remind them to always stop and look both ways before crossing! 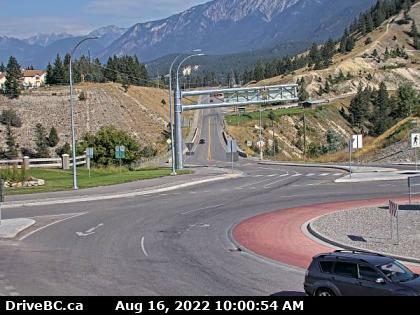 Local Businesses and Organizations: If you wish to get involved please contact Cortney by email events@invermere.net or call 250-342-9281 ext.1232. Businesses are reminded to provide nut free treats! Local businesses are also encouraged to dress up in costume as they welcome families into their shops.